"Barangay Week is a venue for bringing the city government closer to its constituents at the barangay level. “Learning Barangay Week”, Barangay Week’s latest version is intended to empower barangays to effect a more transparent, accountable, participative and responsive governance through trainings and subscription to the Performance Governance System (PGS)". Enthusiasm could be felt as Barangay Week Learning Program started. It was now centered in: learning of the laws or set of rules which when properly interpreted would best benefit everyone, study of alternative livelihood, in demand skills training program for the Out of School Youth, training and preparation needed during disasters and calamities (fire safety seminars, search and rescue) and additional information for the proper care of our Mother Earth. Pastor. Allen Alvaro, Administrative Pastor of TUMC led the opening prayer followed by the singing of Lupang Hinirang, Dugong Balangueno and Hawakan mo ang Bukas as accompanied by the Banda Dos Nuestra Senora. Our beloved Mayor, Hon Joet Garcia gave his inspiring message explaining the significance of Learning Barangay Week Program. He also cited the growing number of OSY in the City. He was very keen in sending the message across determined in putting an end to the OSY, with the pilot project of Zero Out of School Youth here in Barangay Tortugas. Among the other greeters were Hon. Vice Mayor Noel Valdecanas, Hon. Councilor Anselmo Sanchez who both gave words of commendation for our barangay. The Junior Barangay Officials Program was also initiated during the Learning Barangay Week wherein members of the Elementary School Government body would stand as the Barangay Council for the day. The President would be the Barangay Captain, while all the rest would be the KAGAWAD members. The first set of pupils served as the officials and did actual work for the whole day to give them an insight on how to govern the Barangay. The signing of the Memorandum of Agreement, MOA, of the City Government of Balanga represented by Hon. 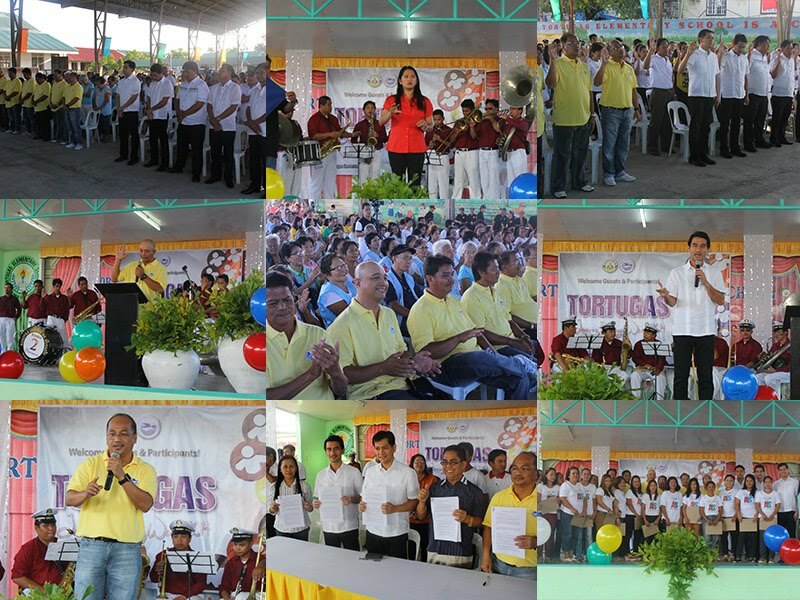 Mayor Joet Garcia and the LIGA ng mga Barangay represented by Hon.Victor Baluyot Jr was also done during the Barangay Week Celebration with the BPSU to provide technical expertise. This is for the “Balanga Leadership Conference for Barangay Executives Training” which aims to focus on educating Barangay officials in the city of Balanga on proper governance procedures. Salamat po sa lahat ng naki-isa sa makabuluhang programa!